Well, this year I’m in no mood for Thanksgiving. Quite frankly, the state of my life, health, and the world in general has me feeling grumpier than a starving vegan in a steakhouse. Between being increasingly decimated by a progressively crippling disease, forced to witness a nation and a planet gone mad and suffering through the worst fantasy football season I’ve had in over a decade, I find myself more inclined this year to say “no thanks” than “thanks.” So, I’ve decided to invent my own little holiday: No-Thanksgiving, a day when one can feel free to share their disdain and disgust with freedom and pride. No-Thanksgiving coincides precisely with Thanksgiving, so those who find themselves forced this Thursday to sit around a table of people gushing with gratitude while feeling only varying shades of repulsion are hereby granted license to let loose with a bile laced torrent of grievances when it comes your turn to speak. You’ll feel a whole lot better, and you can tell the others at the table – as they look at you horrified in slack-jawed bewilderment – to pull up their big boy pants and just carve the freaking bird. And then you must swallow some air and unceremoniously burp out a hearty “Happy No-Thanksgiving!”. A burped “Happy No-Thanksgiving” is the only mandatory ritual required of those celebrating this new holiday. I am horror-struck at the destructive power of my disease, which knows no bounds and defies any attempts to arrest it. This thing is Godzilla, and my life is Tokyo. It doesn’t help that during the last few months I’ve been hit with a series of flu bugs and other viruses, which are to multiple sclerosis as fine hooch is to a recovering alcoholic clinging to the edge of the wagon. The frightening thing about my getting sick with any kind of bug is that the resulting physical carnage always proves to be a preview of things to come in the not-too-distant future of my disease’s relentless progression. I’ve often surprised myself and others with my stoicism in the face of hurricane MS, but I must admit there have been moments these last few months that have left me scared shitless. Not being able to get myself in or out of bed, control my bladder, or summon up the strength to push a fork through a piece of broccoli are not exactly harbingers of a rosy future. Note to my doctors or any other doctors who happen to be out there: help! And to my disease: an emphatic no thank you! I am driven to distraction – literally, I can’t sleep – over the abominable tax plan being rammed down the throats of the American people by Congress. I’ve always tried to keep politics off of these pages, but not speaking out against the abhorrent is the worst kind of cowardice. And these tax proposals, as currently constituted, are most certainly abhorrent. Putting aside the fact that they are yet another attempt at supply-side economics, a theory which has never, ever proven successful whenever it’s been implemented – “But, but, Reagan!” I can hear some sputtering, conveniently forgetting that President Reagan raised taxes 11 times after he initially cut them (click here) – what is really unsettling me is the fact that by all objective estimates the current tax proposals will increase the federal deficit by between $1 trillion and $2 trillion (click here, here, and here). This very likely will trigger mandatory cuts to Medicare (click here), and I fear will eventually be used as an excuse for yet another misguided push to privatize Social Security, Medicare, and Medicaid. The combined effects of these changes would leave millions of the most vulnerable Americans – the elderly, chronically ill, and disabled – without the social safety net they so desperately need. There is no doubt that the US is in need of tax reform, and getting through the process will always be as pleasant as a national root canal, but the hyper-partisan tax proposals now on the table should be anathema to all reasonable Americans. So, with all the strength I can muster, I shout “no thanks” to the current version of tax reform. If you agree, call your Representatives and Senators at (202) 224-3121. I’ll end my list here due to time constraints, though in my current state of disgruntlement I could easily extend it ad infinitum. No-Thanksgiving day will soon be upon us, and it wouldn’t make much sense to publish this article once the day has passed. 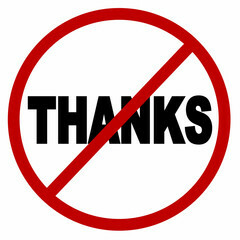 I’d ask all who wish to join me in celebrating this new holiday to refrain from throwing a drumstick at your idiot uncle and instead help to grow the popularity of No-Thanksgiving day by providing a list of your own candidates for “no thank you’s” in the comments section of this essay. Come on, give voice to all of your pent-up grievances, grudges, and gripes so that all of your fellow MS curmudgeons can revel in your misanthropic meanderings! WK Honored – And You Can Get A Free Comprehensive Health Panel Test! 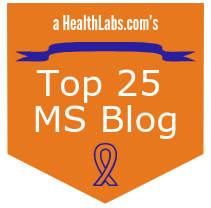 I’m pleased to announce that Wheelchair Kamikaze has been named one of Healthlabs.com’s top 25 MS blogs (click here). WK nabbed the fifth spot on the list, just behind the blogs of such huge organizations as the National Multiple Sclerosis Society, the UK’s MS Society, and the Multiple Sclerosis Association of America. While this is a tremendous honor, the best part is that Healthlabs.com is offering all US-based Wheelchair Kamikaze readers a free Comprehensive Health Panel, including blood tests and urinalysis. Wheelchair Kamikaze has achieved success beyond anything I ever could’ve dreamed when I started these pages back in 2009. I honestly never expected more than a few dozen people to ever give this blog a gander. Now, nearly 9 years later, WK is approaching 3 million page views. Amazing. Heartfelt thanks to all Wheelchair Kamikaze readers, and of course to Healthlabs.com. Tremendous congrats go to all the other blogs that Healthlabs’ list. Each selected blog is high-quality, entertaining, and informative, and I urge you to check each of them (click here). Healthlabs.com has provided very informative synopses of each, so their list of chosen blogs is a valuable resource in and of itself. Now, for the really good stuff – Healthlabs.com is generously offering free comprehensive health test panels (a $99 value – click here) to all US-based Wheelchair Kamikaze readers. This health test panel includes blood tests for lipids (cholesterol levels), a comprehensive metabolic panel, iron and total iron binding capacity tests, a thyroid panel, and a complete blood count (CBC), as well as a urinalysis. 1. Wheelchair Kamikaze readers can place their orders over the phone by calling 1-800-579-3914 . Please mention that you are calling about the free Comprehensive Health Test Panel for Wheelchair Kamikaze readers. 2. Healthlabs.com’s certified health care specialists will order a Comprehensive Health Test Panel for you free of charge over the phone. 3. Once the test is ordered, readers can simply use the lab nearest them. Healthlabs.com has a partnership with Quest Diagnostics, so users can get tested at any of 2,000 labs across the United States. Most labs are open during regular business hours, and no appointment is necessary. Readers can use Healthlabs.com’s "Find a Lab" tool (click here) to find the lab nearest them. 4. Results are delivered by email in 1-2 business days. This offer expires on November 1, 2018. I’d asked anybody taking advantage of this offer to please leave a few words about their experience in the comments section of this post. I’d like to keep track of how well the process goes. Once again, a big thank you to Healthlabs.com and to all the readers that have made Wheelchair Kamikaze a popular part of the MS Internet. I’m humbled to have been able to be of service through the years to my fellow members of the MS club, one which none of us ever wanted to join. You’ve all given me some method to the madness of my experience with this disease. For that, I will forever be grateful.